Home » Blogs » Ritual & Ceremony » Why ritual & ceremony plays an important & life enhancing role! Why ritual & ceremony plays an important & life enhancing role! You may well ask, where does Ritual & Ceremony come into my life. Well, we are creatures of habit and most of us perform different kinds of Ritual & Ceremony throughout our lives and often on a daily basis. We perform many of these without even realising we’re doing it! We wake up in the morning and perform a set of different Rituals & Ceremonies, from that first cigaret (all be it that less people smoke these days!) to brushing our teeth, to that first cup of tea or coffee, to picking up our keys, before heading for the car, bus or train, that takes us to work etc. At work we do the same, we perform a different set of Rituals & Ceremonies and at the end of the day, we come home and continue to perform different sets of Rituals & Ceremonies before we fall asleep and do the same the following day. We take part in other forms of Ritual & Ceremony throughout our lives, whether it’s attending a wedding, a church or other faith Ritual & Ceremony, visiting a stone circle or monolith at specific times of the year, like at Stonehenge or Avebury Stone Circle, to attend a summer or winter Solstice Ritual & Ceremony Celebration. All of us, in some way or another perform Rituals & Ceremonies at different points throughout our lives. You may well say, our daily routines are not Rituals & Ceremonies, they are more daily conditioning. Whilst this might have some truth, aren’t Rituals & Ceremonies exactly that – spiritual conditioning – which so many of us grow up with. After all we live in a religious society (even if we have no religious conviction ourselves). We are surround by spiritual leaders, from all faiths, who advocate many different forms of Ritual & Ceremony as part of their religious practice. In my early teens, my parents encouraged me to attend confirmation classes at our local church. At that age I did not understand what I was being taught and instead decided I did not to become confirmed, even though I enjoyed many of the Rituals & Ceremonies I attended at our local church. When I reflect back, I think it was one of the first times in my life I had actually made a conscious decision about something so important – my Spirituality, which in turn invoked my Spiritual awakening! Despite turning my back on the church, I was not turning my back on spirituality. Since making that decision, I have continued to search for a spiritual meaning and purpose to my life! At the time, I probably didn’t realise I was turning my back on an organised form of religion, many of which I now see as dogmatic, controlling, subversive and anything but leading to enlightenment! Plus many organised religions are very unaccepting, damning and in turn dis-empowering towards Lesbian, Gay, Bisexual, Transgendered & Questioning (LGBTQ) people’s search for a spiritual connection, which includes being able to access Rituals & Ceremonies. In the late nineties, I became interested in Buddhism, which also rekindled my interest in Ritual & Ceremony. Though the first really life changing Ritual & Ceremony I attended, was in 1990 and facilitated by Paul Rebillot, who is sadly no-longer with us. He created a Medicine Wheel – Ritual & Ceremony, as part of his seven day workshop entitled ‘Owning the Shadow‘. That experience inaugurated me into the impact and power a Ritual & Ceremony can have on your life and how it can change it forever! I am writing a specific article about the Medicine Wheel – Ritual & Ceremony, as my next Blog. Now I consciously choose to take part in different kinds of Rituals & Ceremonies, as I find them to be very powerful and memorable experiences, which have affirmed and even changed my life. Despite being an Agnostic, one day I would like to attend a Russian Orthodox Church high mass. I first heard about them on a Radio 4 program about the Russian Orthodox Church in London. Their Rituals & Ceremonies sound amazing and really powerful, so I’d love to experience one. Involving a water dragon, a rising full moon, a setting sun and a stone circle! Last September 2015, my partner Harry and I were in discussion about a Ritual & Ceremony we wanted to perform, to honour & commit to a specific new event in our relationship. We knew we wanted to do something special, but just weren’t sure what, or how to do. As I reflect back on what we did end up doing, it was also about creating something that neither of us would ever forget and something that we could both do again, if we wanted to further commit, in the future. 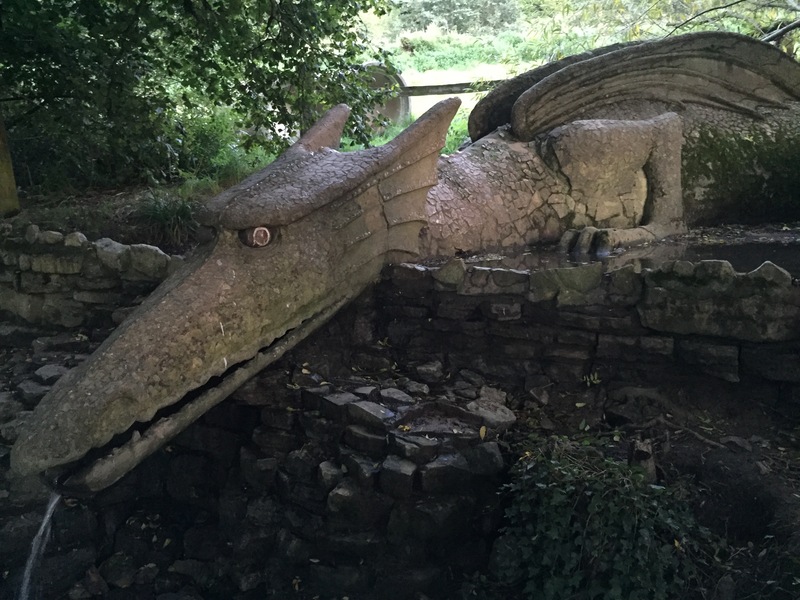 One day, in September 2015, I offered to take Harry for a walk to discover a dragon, which is hidden away in a small wood in Somerset. Harry didn’t know exactly what I was taking him to see, though as he has such a wonderful imagination, he was well up for the adventure! 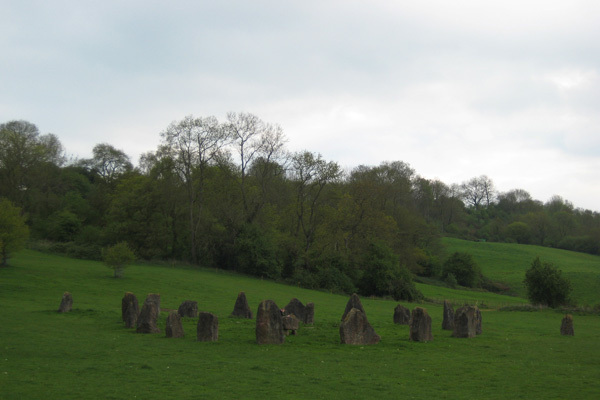 The wood in which the dragon is hidden, is just off a field with a stone-circle in it. We entered the field and went and sat under a beautiful oak tree, with a carved wooden seat under it, which was commissioned and put there by a friend of mine, in memory of a friend of her’s. We sat looking out across and down the valley, where way off in the distance, we could see Glastonbury Tor. 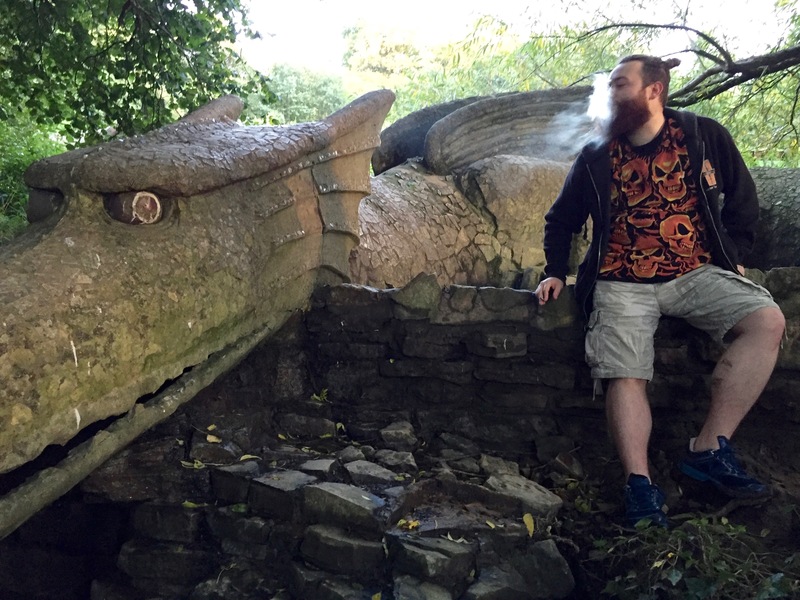 After a while, I took Harry into the wood to finally show him the 40ft water Dragon. Harry was really excited and taken by the dragon. He had enjoyed the anticipation and build up to finding it and I was loving being the person who showed him something, which most people don’t even know exists. Whilst we were there, it suddenly dawned on me, what a perfect setting and opportunity for our Honour & Commitment – Ritual & Ceremony. We were in the company of a 40ft water dragon, there was a stone circle in the field next to us and the sun was just beginning to set and a full moon had already started to ascend the horizon. You couldn’t have asked for a more perfect set of ingredients, to make our Ritual & Ceremony really special and something we could remember and cherish for a longtime to come. We decided on what we wanted to say, which will remain between the two of us. We made it short and simple, but included the important things we wanted to honour and commit to. We then climbed down the side of the wall, in front of the dragon and joined our hands together and placed them in the dragons mouth, which was flowing with water. We then both recited the words we had agreed on three times, whilst our joined hands were in the flowing water coming out of the dragons mouth – we both fell about laughing during the second and third reciting, as what we were doing seemed strangley funny, whilst at the same time being one of the most beautiful, spontaneous and loving things I have ever shared in my life! After we thanked the dragon, for helping us with, and being a participating witness for our Ritual & Ceremony, we then walked back into the stone circle field and entered the stones. We both climbed onto a stone in the centre, which lies on its side like a giant alter piece. Behind us to our left, was the end of a setting sun and behind us to our right a full moon was now clearly evident. We quietly stood holding each other, whilst we took in our incredible surroundings and reflected on what we had just done. We couldn’t have asked for a more memorable and perfect Ritual & Ceremony and one that has truly enhanced our lives so much, through its sheer beauty, simplicity and set of components etc. All of us have the ability to create Rituals and Ceremonies, which we can use for many different things we might wish to celebrate, dedicate, release, discover etc. So I urge you to think about ways in which you too can create different kinds of Ritual & Ceremony in your own life, as the rewards can be profound and quite often life affirming and changing. Please feel free to comment on this article, or add your own Ritual & Ceremony ideas and experiences below. If you are interested in taking part in a Ritual & Ceremony, please click this link to my Ritual & Ceremony Workshops page.